COH - COH Plays Everall. Vinyl LP. Bleep. 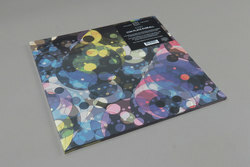 New LP from the Swiss imprint Hallow Ground! Ivan Pavlov opts for a tribute to the late composer John Everall. Super sick stuff here, think electronic minimalism a la Terrence Dixon or Morphosis. The opening track is an exercise in sonic enchantment, particularly making us think of the work of Charles Cohen and Jeff Cain. The Russian Pavlov works his magic across seven tracks of hyper clean, ritualistic arpeggios and sequence based sorcery. Real deal club music here if you like your dance floor slightly challenging. Also worth a look if you dig the likes of Emptyset!